Located 5 minutes from Princeton, in the heart of Lawrenceville's "village". At dinner (Tues-Sat), the menu which has been described as "New American with Mediterranean influences", always uses the finest seasonal ingredients. You'll find innovative dishes as well as casual favorites. With a very entertaining open kitchen and live music on Friday and Saturday evenings, the atmosphere is very festive. 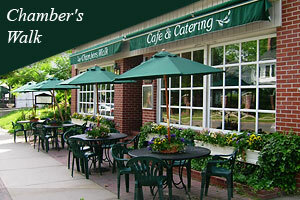 At lunch time (Mon-Fri) fabulous soups, salads, specialty sandwiches and entrees are available. BYOB for lunch or dinner and their dining room is the perfect place for a private event ~ not just a corner of a room somewhere, but the entire dining room and staff at your service. Other events include cooking classes on Monday evenings and Team Building events.